Just around the corner from where I live is this shop. Its in a small parade opposite Portslade train station, along with a couple of barbers, a greasy spoon cafe, a bric-a-brac shop and a newsagents. The parade is typical of the kind you find at the fringes of suburbia, where town centres dwindle to broadly residential areas with a few clusters of shops squeezed in between. This shop used to be a record store, with a couple of rare items on the wall and the usual bargain bucket MOR in the shelves. After that, it sold second-hand white goods, and then about 6 months ago it had a brief refit before re-opening as a place to get your feet nibbled at by small fish. My daughters found this fascinating, and would peek in the window whenever anyone was getting a treatment, at least until the owners put up blinds to stop them gawping. I was fascinated for a different reason. The shop seemed to generate business solely through Groupon promotions, and was doing alright for a while, with a steady stream of feet walking in for the Garra fish to nibble. Then, a couple of months ago, the blinds were open more often, the fish looked like they were getting hungrier, and the only thing to see was a bored-looking assistant. 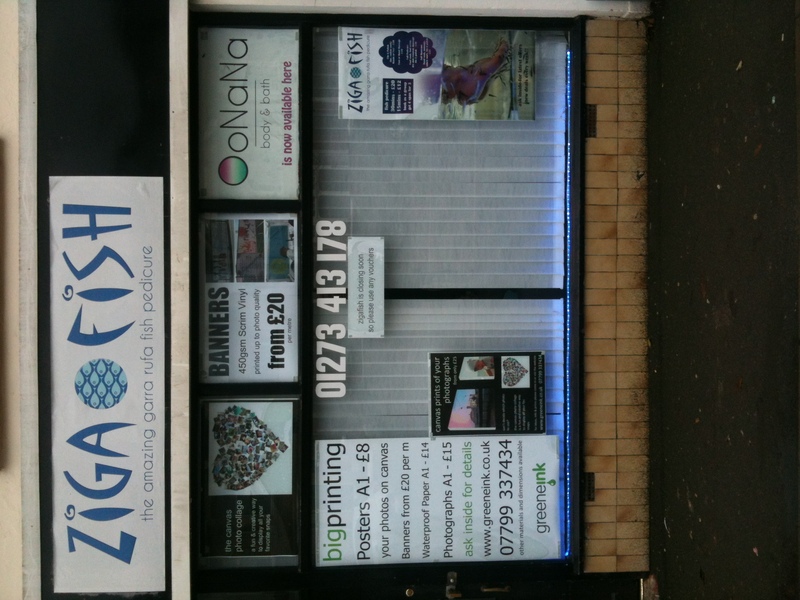 A few more posters started appearing in the window for other services – photo printing on banners or canvases, and OoNaNa body and bath treatments. I imagine the owners were picking up other business ideas from Groupon that had that magic formula – small up front investment in stock/equipment plus niche demand times groupon promotion equals a profit marginal enough to pay the rent on a small shop in a fringe suburb. The window started to look like a physical version of the ads you see on bad websites – it was only a matter of time before teeth-whitening or simple weight-loss remedies starting appearing. I wonder if this is the future of retail for some shopping areas in these austere times? It feels like the hipster-led ‘pop-up shop‘ idea has trickled down to something approaching a Demand Media business model for physical shops. The Groupon Shop feels like a brave, but slightly clumsy, attempt at algorithmically-driven retail, in which a tiny cost base can be the justification for a series of iterative attempts at creating a viable business model. Previously, only charity shops have had a cost-base low enough to take over the empty high st in a recession, but perhaps Groupon shops are a sign of things to come? This feels like James Bridle‘s New Aesthetic pushing through into suburbia, in the most vernacular way imaginable. The future of retail is not malls full of check-out-less Apple Stores and immaculately groomed geniuses. Its marginal profits promised by multiple algorithms indexing millions of search queries, emerging like weeds in the gaps in the High St vacated by chain stores who have themselves been eaten by the remorseless efficiency of the Internet. Or at least it might be, if the Groupon Shop wasn’t closing, perfectly mirroring the bubble of Groupon itself. What will appear there next? I’d like to think the owners will have another try, learning to iterate quicker, and discovering another couple of dozen business models that they can pick up and discard based on the algorithms of coupon sites. Maybe they need to be more like Zynga, who are the current masters of extremely rapid iteration. I’d quite like to buy our milk and eggs from a Farmville shop. Is Youtube a TV Channel?